Over the years, as a professional wedding and portrait photographer, I sold many prints and other photo products to clients. I always knew who was purchasing my work. Since signing up with Fine Art America in January of 2012 and making my first sale in June, the buyers have been anonymous. The only information I receive is the title and type of artwork purchased, and the location where the order came from. This has been a new experience with not knowing the client or whether they are a collector or a commercial buyer. Marketing to new customers is quite a challenge. Since there are no demographics available for marketing my fine art work, I turned to Geo-Analytics with hopes this would give me some insight to finding new clients. The map you see below indicates the locations where artwork was purchased. I used Google Maps to chart each sale. Clicking on a pin or artwork titles in the left window opens a context menu providing the location and type of print as well as a direct link to the picture the was purchased from dalekincaid.com. Colored pins represent popular sales, such as the blue pins for the Cleveland Skyline favorite. The orange pins are the Walking With Grandma print. The green pins are a combination of all my Birds Of Prey artwork. And the red pins are everything else. I have studied the Geo-Analytics map in an effort to determine what marketing efforts it might reveal. When I figure that out I will let you know. Meanwhile, I will keep on doing what I do, charts sales and see where it leads. Comments and ideas are always welcome. Click on the map to view full screen. I recently visited the Lakeside Daisy State Nature Preserve in Marblehead, Ohio. This was my first visit to view the rarest of Ohio native wildflower endangered species. Lakeside Daisies normally bloom early to mid-may. 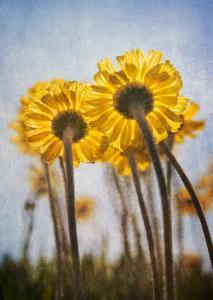 Due to an early spring, the daisies were past their prime. So I had to make the best of a bleak situation and the mid-day sun. This was one of the last pictures I captured laying very uncomfortably on the ground. Artwork was added to make this a delightful addition to my Texture Art Photography project. One of the things on my bucket list has been has been to photograph a sunflower field. I finally made it out to the Prayers For Maria Sunflower Field in Avon, Ohio this past September. What an incredible place with nearly a mile long field of sunflowers. It was an awesome feeling just being there and watching the many people that came to visit. I have added a new gallery at www.dalekincaid.com dedicated to the PRAYERS FOR MARIA CHILDREN�S GLIOMA CANCER FOUNDATION. Prayers from Maria is dedicated to funding global research into the causes, prevention, treatments, and cure for the deadliest childhood brain tumors known as gliomas; raising public awareness about gliomas and bringing hope to children and their families who deal with the hardships of this disease. 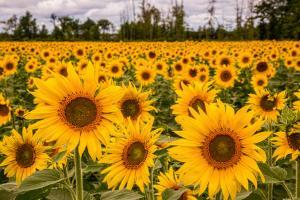 Visit the web site at prayersfrommaria.org �- A mile long field of sunflowers is planted each year along a stretch of I-90 in Avon, Ohio in memory of Maria who died at age 7 from a terminal brain tumor. Two million seeds of hope were planted in 2015. What a spectacular sight to see and to experience such a feeling of hope and spirit. For each sale from the PRAYERS FOR MARIA Gallery 25% of the profit will be donated to the Foundation. Thank you to the gallery group administrator Karen Wiles of HOTEL LOBBY ARTWORKS for featuring 'Exposed To The Light' - fine art photograph by Dale Kincaid. 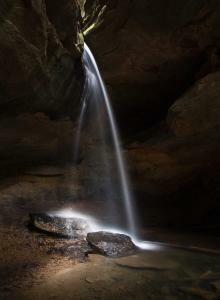 This image was created at Conkles Hollow in the Hocking Hills region of Ohio. I had visited and photographed the waterfall a number of times, but my results were always less then gallery worthy. During a photo workshop led by Ian Adams in the spring of 2012, I was determined to create an artistic work no one has ever done before. As you can see, my results were quite unique and interesting.